The Tyrone boss is gearing up for an All-Ireland final with Dublin. 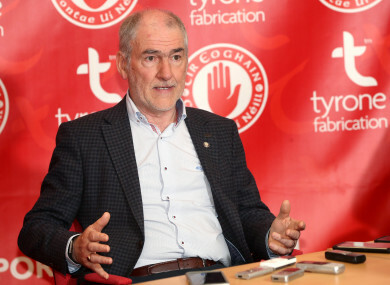 TYRONE MANAGER MICKEY Harte has doubled down on their position regarding RTÉ’s coverage of their team. The national broadcaster released a statement yesterday morning at 9.01am stating they had made an approach to do pre-match and post-match interviews with the Tyrone camp ahead of the upcoming All-Ireland final. A boycott has been in place since 2011, when Harte felt aggrieved over a letter he had sent to RTÉ in private was leaked to journalists, and a radio sketch featuring the track ‘Pretty Little Girl from Omagh’ aired six months after the death of his daughter, Michaela. Three-time All-Ireland winner Owen Mulligan has been critical of his former manager in the past, most recently in May after Harte started Colm Cavanagh, Lee Brennan and Tiernan McCann in the Ulster Championship defeat to Monaghan, all of whom were carrying knocks into the game. “What was criminal from Harte was that he started three injured players Cavanagh, Brennan and McCann. None of them made an impact and they were taken off early. When you’re playing a quality side at this intensity you can’t expect to carry anyone with an injury. Surely Harte knows this?” said Mulligan at the time. Harte’s former captain Sean Cavanagh has used even more incendiary language this season in his media appearances, suggesting at one stage in May that; ‘Mickey’s the man, and that’s just the style of leadership he has, it’s quite an autocratic style at times but that’s just where he’s at’. Harte responded to the various criticisms, saying, “It’s not a big issue. I mean, it’s only a big issue if you allow it to be. I mean, everybody has their opinion and sometimes that opinion is solicited from them to make a headline – and I understand that. “Let that be as it may. I learned a long time ago that we shouldn’t determine how well we feel ourselves by what somebody else says. That’s really handing away the power of your well-being to somebody else. Ahead of the final, Tyrone only have Cathal McCarron ruled out through injury, with Conor Meyler making a good recovery from bone bruising around the knee, sustained in the Super 8′s win over Donegal. “Conor obviously had quite a knock and he’s working very hard to overcome that, and the signs are positive that he will be available for some part of this final,” Harte said. Email “Harte on Tyrone's RTÉ position and brands criticism from former players as a 'cheap shot'”. Feedback on “Harte on Tyrone's RTÉ position and brands criticism from former players as a 'cheap shot'”.